“I wanted to take a moment and thank you for what you do and for making these chews. 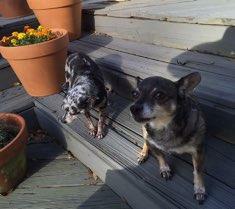 I have two Chihuahuas who are 13 and 11. Yesterday I received Treatibles and started using them. I noticed a difference in them right away. Today my 13-year-old has only had Treatibles and he is outside running around.